Fingers crossed for some nice warm weather for your grandson's visit. This is such a pretty card! Love the colours and the image is done so pretty! Oh, this is so pretty! Love it. Love this Sylvie...picked it from the others to leave you a comment...I especially like how you have made the flower pop out. So beautiful. Your neighbors will feel very,very special with this one. This is one I would display in my home! This card is outstanding all the butterflies, the coloring excellent..
Wow! 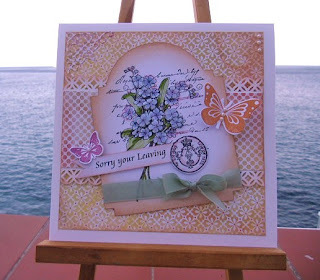 You've been busy, I especially love this card, such a pretty image and perfect papers. Have a lovely time with your Grandson, I hope it has warmed up for him, having said that, if he is visiting from the UK 15 degs will feel hot - we're barley getting above 0 over here.